The medicalization of ordinary life has been a slow process in the making and the sad result of a combination of factors. Diagnostic manuals like the DSM have contributed to this and so have the reimbursement procedures of health and social insurances. Careless science reporting, advertising excesses and the lowering of scientific standards in clinical and field trials are other contributing factors. 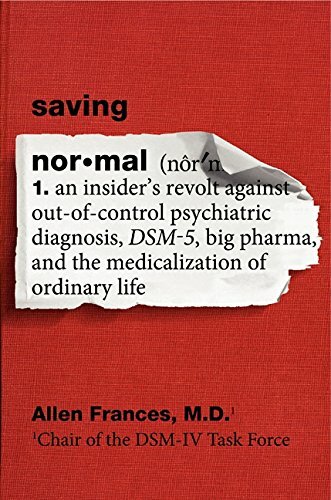 Having chaired the task force that prepared DSM-4, Allen Frances knows what he is talking about. Some of the criticisms he fares against DSM-5 also apply to his own work and he is sincere enough to admit these. But DSM-5 displays several new and more serious problems, besides accentuating those of the past. The chapters that focus on the fads of the past, present and future are the strongest part of the book. Fads of the present include attention deficit disorder (ADD) and autism. Insofar as adults are concerned, depression is the big cash cow. According to Dr. Frances, this is all wrong. Tantrums may be difficult for parents to bear and cope with, but they are part of child development; forgetfulness in older age occurs without necessarily leading to Alzheimer’s; and excessive eating is unhealthy but not a mental disorder. Other problems with DSM-5 include the introduction of an “adult attention deficit disorder” category and a loose definition of “somatic symptom disorder” for tapping on psychosomatic medical problems. Additionally, patients are advised to adopt a more self-critical approach: “The key to psychiatric diagnosis is self-report, and this is impossible without careful and persistent self-observation”—a useful piece of advice that does not always work in practice since it takes for granted that patients know what constitutes a symptom and how symptoms tend to cluster together. Yet most patients do not have this knowledge and do not wish to obtain it, especially not when in a situation of psychical stress. The core problem of all diagnostic manuals is that they operate with manifest symptoms. These are counted together and assessed in terms of their intensity and duration. Such an approach is inherently prone to unreliability besides confounding different analytical levels. More importantly, this approach completely ignores the hidden psychodynamics driving symptom formation. In the end, that we must today fear that the medicalization of ordinary life has something to do with our having excessively medicalized mental disorders.